...with a Deluxe Elegant & Contemporary Watch featuring a Timeless Design. will show your sincere Appreciation to Premium Customers & Top Employees. Fotowatch offers free to help the customer in visualizing the logo watch. 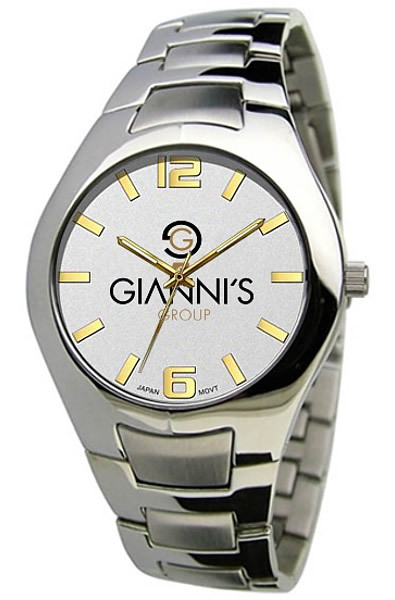 The e-Sample is a photo of your selected watch whose dial has been customized with your logo. It allows you to see exactly what your watch will look like at delivery - BEFORE you order! I have received the watches and they are GREAT! Everyone I have shown them to agree. Please know that I will share my great experience with your company with others and hopefully can generate some business for you to compensate for my insanely rushed order! Many thanks and hope to do business with you again in the future. I just want to let you know we received the watches and they are wonderful - even better than we imagined. We will definitely keep Fotowatch in mind for any future projects we might have. Tammy, I wanted to tell you that the watches were a huge success at our celebration meeting. Everyone really loved the watches. Is it possible since you have our logo information to purchase an additional watches...that would be available by the end of March? Please let me know your thoughts, and thanks again for everything.